*Original story available on WKU News. Please visit https://wkunews.wordpress.com/2014/12/16/library-student-scholarship/ to be taken directly to the story. WKU senior Katherine “Katie” DeCoursey of Hopkinsville was recognized last week as the recipient of the inaugural WKU Library Student Assistant Scholarship. 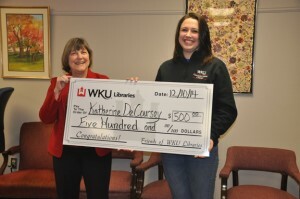 DeCoursey has worked for the WKU Libraries for three years and will be graduating in May 2015 with a degree in Communication Sciences and Disorders. Her library duties include working as a Circulation Assistant and as a Stacks Management Assistant, cross-training for library security functions and assisting with complex projects, such as implementing StackMap (digital search software), installing compact shelving, shifting entire floors of main collections and relocating Circulation Services during a remodeling project. DeCoursey was hired the second semester of her freshman year, working winter and summer breaks in addition to the regular academic school year. “I am very proud of my job. The Library has supplied an environment that has helped me grow as a student through my college experience,” DeCoursey said. WKU Libraries Dean Connie Foster (left) presented the inaugural WKU Library Student Assistant Scholarship to Katherine “Katie” DeCoursey.